Dorothy Miller, also known as Dot Miller, is transforming traditional craft into couture with her self-titled collection of straw bags. This age-old basket weaving technique takes on a new life in the innovative forms, colours and textures which the collection encompasses. 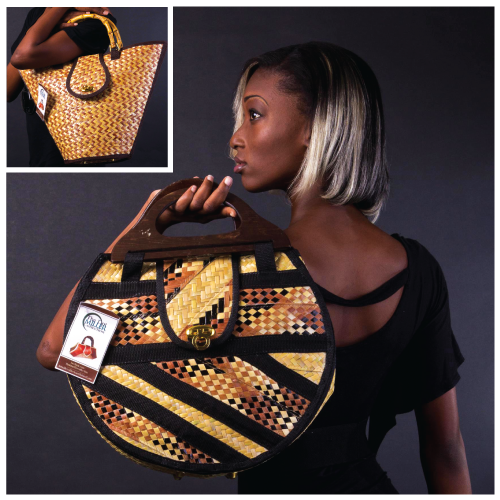 The striking designs make the bags appealing to a wide range of ages and tastes while remaining identifiably Caribbean craft: embracing the past but celebrating the present. Since its launch in 2009, the Dot Miller Collection has developed a reputation in the Bahamas for impeccable craftsmanship and attention to detail. Her clientele includes public figures, celebrities and other high-profiles personalities. Each bag in her exclusive collection is uniquely made and although several bags may follow a particular theme, none are the same. The Collection has received constant accolades in the Bahamas, being awarded at the each staging of the Bahamian BAIC Arts Festival of which it has been a part between 2008 and 2013 as well as at the Bahamas Tourism Trade Show. The line also copped the Ministry of Tourism Cacique Award in 2011 and the creator was honored with the inaugural Bahamian Icon Award in 2013. Miller also received international accolades when she was designated Handbag Designer of the Day by website Handbag Designer 101. Dot Miller will be bringing her unique interpretations of traditional Caribbean craft to Design Caribbean at Calabash 2014.